The ZBrush to KeyShot Bridge is simple and easy to use but there are a few options can have great impact on the way you work. This is particularly true of the Auto Merge mode. The options are in the Render>External Renderer sub-palette. KeyShot enables the Bridge between ZBrush and KeyShot. When enabled, any time you tell ZBrush to do a BPR render it will automatically send your model to KeyShot. If disabled, ZBrush will use its own BPR renderer. The Max Faces mode splits the current model into smaller parts. The size of each part will be no larger (in millions of polygons) than what has been set by this slider. Increasing the slider’s value sends your work to KeyShot in larger chunks. Depending upon your computer configuration, this may produce slow­downs or cause the Bridge to hang entirely. Imagine crossing a foot bridge. If you tried to drive a tank across, it would most likely collapse. But if you disassemble the tank and carry it across one piece at a time you’ll be able to reassemble it on the other side. The actual capacity of your bridge depends upon your system specs. But even with a powerful computer, keeping a low value will produce smaller chunks of data when sending to KeyShot and usually speed up the process. 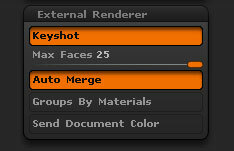 If the Auto Merge option is active, these smaller chucks will be merged together inside of KeyShot. Because ZBrush can send large amounts of data to KeyShot, the information usually needs to be split into smaller chunks to speed up the Bridge process. (See the Max Faces section above.) The Auto Merge mode then tells KeyShot to weld all these parts to rebuild the models as they originally were in ZBrush. Of course, you can increase the Max Faces Slider value to send the data in larger chunks, thus avoiding splitting of the model. However, since the maximum value is 10 million polygons you will most likely need to merge parts of your model sooner or later. If you don’t enable Auto Merge mode, your KeyShot scene may contain hundreds of parts. For this reason, it is strongly advised to leave Auto Merge enabled. So why would you ever want to turn Auto Merge off? There may be times when you want to do quick renders of your models while working and are not going to be applying KeyShot-specific materials through the Scene tree. In that case, turning Auto Merge off will make the Bridge operation much faster because KeyShot won’t need to spend time welding the model back together again. The Group by Material mode creates a separate group for each ZBrush material applied to the model’s SubTools. This means that hav­ing multiple materials applied to your model in ZBrush will produce the same number of material groups in KeyShot. These groups are simply defined by the materials in ZBrush; no other visual representation exist. When the model is sent to KeyShot, dragging a material from the KeyShot library onto any part of the model which is part of a material group will apply that material to parts that share this material group. When this Group by Materials options is disabled, each model is independent and dragging a material from the KeyShot library onto the model will affect only that model. When enabled, the Send Document Color mode instructs KeyShot to set its own document background color to match your ZBrush document. This function doesn’t send any background image to KeyShot; it only sends the color values found in the Document palette.